Before I had Laurel, I spent some time putting together freezer meals. I had never done this before and I really wanted to focus on having healthy, hearty meals so that even when things got crazy with a toddler + newborn I could still put dinner on the table. There's just something about putting a meal on the table...am I right, ladies?! So, I compiled some of my favorite recipes and put them together for a free group I can a few months ago. I'm preparing to start another free freezer meal group in February and I asked myself, "Why have I not shared these on the blog?!" Honestly, this was a lifesaver for me as a new mom of 2 and it worked so great, I plan to start doing it quarterly throughout the year so that we can still have a home-cooked meal on those crazy busy nights. I hope you find it helpful as well! For those interested, this is the first compilation I put together or 10 meals and 2 snacks: Healthy Freezer Dump Meals and this is the shopping list that goes along with it. I'm always in desperate need of meal ideas so thanks for this. I'm going to try the Hawaiian chicken freezer meal this week you linked to! 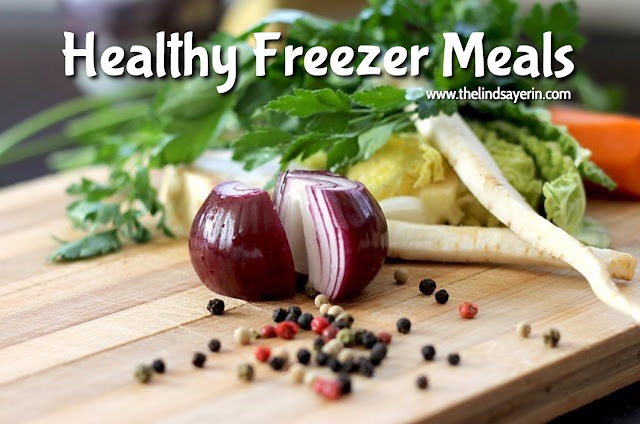 Freezer meals are a great idea! I've done a few in the past, but not a lot at one time. This is definitely something I want to do more in 2017. Thanks for sharing! Great idea! We'll frequently take freezer meals like this to new moms at my office - they love the super easy meal options! I learned years ago about pre-cooking and freezing meals from my mom. She would cook up a storm 2 Sunday's a month making Lazana, Chili, Soups, etc and freeze them to be eaten in the days / weeks to come. Being it is only my husband and myself I usually don't do this unless I can only cook a large portion and then I will freeze 1/2. What a great idea! I love making freezer meals. They are just so handy.